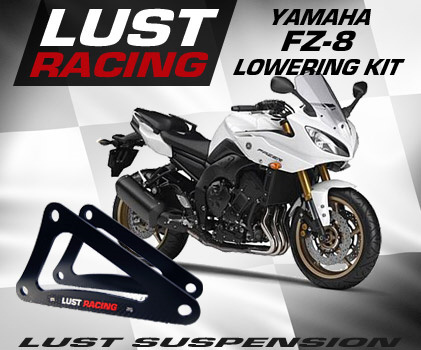 Yamaha FZ8 Lowering kit by Lust Racing. This lowering kit replaces the standard triangular suspension brackets with new ones made in steel by Lust Racing. No other modifications to the suspension neccessary, you can keep the standard Yamaha suspension link. The Yamaha FZ-8 lowering kit comes with model specific installation instruction. Lust Racing suspension lowering brackets are clearly marked for correct installation.